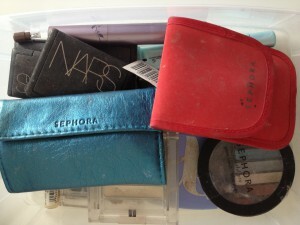 Since I’m still settling into my new place, one of the challenges I face has to do with my beauty products. 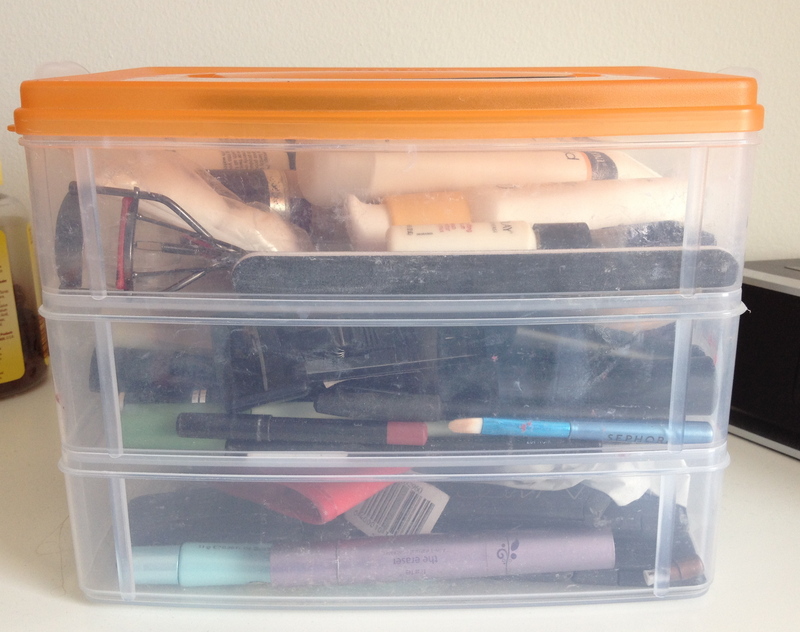 About a year and a half ago, I bought this organizer at Target. It was great for splitting up my numerous products. Plus it was easy to carry from one room to another since I wasn’t living in my own place. I had to figure out a way to consolidate and still have access to the stuff that made me pretty…or at least feel pretty. The first layer is moisturizer and foundation. 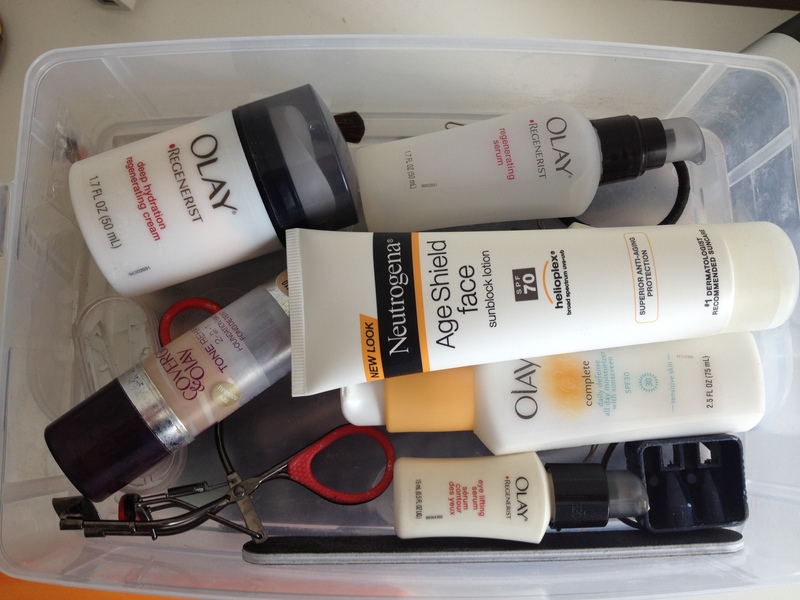 Yes, I love Olay products. My mom uses them, which is why I tried them. They always smelled so good. Now, I use them because they work and don’t irritate my skin. I’ve tried other products, but always end up going back to Olay. The 2nd layer is supposed to be my everyday makeup, but as you can probably see (or not) a few fun/night on the town type make up items have made their way up a layer. The 3rd layer is supposed to be the glittery, glam makeup that I only wear on special occasions or because it’s Friday night. 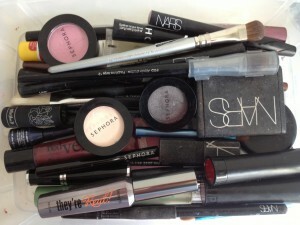 Sephora and NARS are my favorite brands. NARS because the color in the container is true to what ends up on my face and Sephora for the same reasons, but mostly because it’s significantly cheaper than NARS. As I was taking these pictures, I realize that I need to purge this stuff…as well as just generally clean the silly thing. 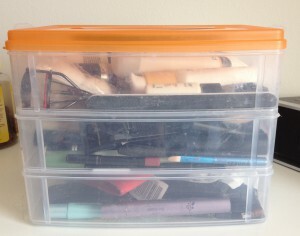 While I do like this method of organization, the snaps on this plastic tackle box are starting to wear, so I’m going to have to start looking for an alternative soon.